Review posted April 5, 2009. Fantagraphics Books, 2008. 325 pages. It's so delightful to get my hands on another volume of The Complete Peanuts, twice a year. In this volume, we have some references to the Vietnam War (with a protest at Daisy Hill Puppy Farm), and Lucy embraces feminism. Snoopy suffers through a stint as Head Beagle, and Woodstock finally receives his name. Could it be that she was the sister of the boy in Kansas who loved the girl with the tattered shawl who was the daughter of the maid who had escaped from the pirates? Ah, the joys of writing! We also see Snoopy in the throes of rejection-slip shock being soothed by a line from Lucy's Psychiatric Help booth: "What you have written, Snoopy, is just as good as a lot of other things you see being published these days..." Isn't that the truth? 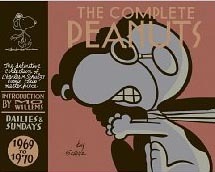 May the volumes of The Complete Peanuts keep coming!